Mersal is Vijay’s Film and Vijay’s all the way. The film in a way is extremely engaging and the credit goes to director Atlee only. He weaved the film so well that is hard to keep your eyes off the screen. However, at 2 hr 50 mins, the film is a bit long, which could have been well edited. Rarely anyone would disagree that Mersal is the most awaited film of the year. With so many controversies that followed it, it is no doubt that film opened with mush fanfare. And perhaps it is right to say, that the film is worth the entire wait. Mersal is this year’s most engaging film, having all the right masalas that constitutes a well prepared dish to please the masses. 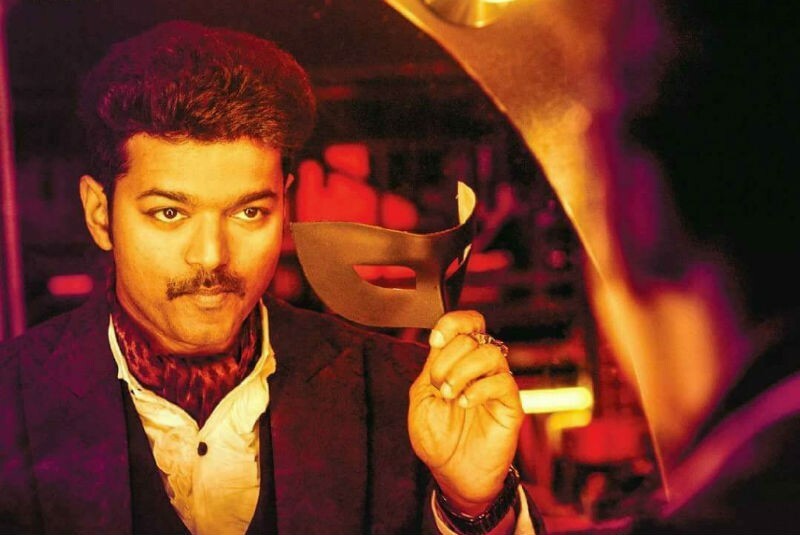 The story has quite an age old formula that follows a pattern from MGR period, where lookalikes swap places to take revenge on their detractors, with Atlee taking hit on a contemporary issue for Vijay. The relatable theme (even though the medical field has been the target for many films) is quite palpable, which is further lined with star power, punch dialogues that double up as political statements, emotional scenes that make us care for its characters, a message that connects with us, colorful visuals, peppy music, and entertaining moments that keep you cheering for the hero(es). The film begins with the arrest of Dr. Maaran (Vijay) by investigating officer Rathnavel (Sathyaraj), who believes that the benevolent doctor, is a criminal mastermind responsible for the kidnapping and murder of a number of people. He is taken away to jail to the sounds of a weeping crowd. It’s very reminiscent of Rajinikanth’s scene in ‘Sivaji’. It is shown that Maaran is also a powerful magician and the narration is such that it makes us believe that he is on a killing spree, only to expose the real murderer Vetri (Vijay again) during the interval block, a rather predictable ‘twist.’ And Vetri slaughters an Indian doctor in Paris on a grand stage in front of hundreds in the guise of a magic trick. Why? Now the narrative moves to flashback episodes to connect the dots. We are introduced to Thalapathy (Vijay) who is a village head and benefactor in Madurai and live a perfect life with his wife Aishwarya (Nithya Menen) and little son Maaran. Entrance of Daniel Arogyaraj (SJ Suryah) an antagonistically placed doctor creates havoc for Thalapathy. Tragedy strikes when Thalapathi and his wife, who gives birth to a second child, die due to a conspiracy by Daniel. It is during this time that you can very well realize that the sons are out to avenge the death of their parents and to clean up the medical system, creating a perfect structure to make a social commentary on the subject. The film in a way is extremely engaging and the credit goes to director Atlee only. He weaved the film so well that is hard to keep your eyes off the screen. However, at 2 hr 50 mins, the film is a bit long, which could have been well edited. The star of Mersal is Vijay and Vijay alone. It is his film all the way and he never disappoints. He carried the film with his acting and engaging performance, shining like a star that he actually is. If you are planning to catch this movie, watch it for Vijay alone and you will come out satisfied.